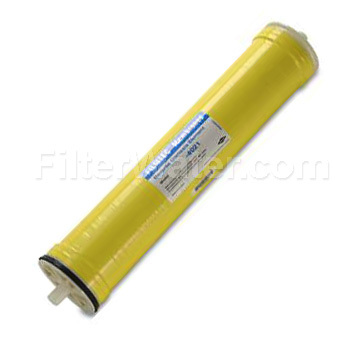 DOW Filmtec TW30-4014 RO Membrane 525 GPD, a 4.0" × 14" Reverse Osmosis Membrane that can provide RO quality water up to 525 gallons per day at a 5% recovery rate. It can operate at feed pressures ranging from 225 psi to 600 psi with 99.5% salt rejection. This element offers the highest quality water for small and mid-size commercial systems purifying less than 10 gallon per minute(2300 L/h) of RO water and is the industry standard for reliable operation and production of the highest quality water in commercial applications. Active Area: 20 sq. ft.
* Permeate flow rate and salt rejection based on the following test conditions: 2000 ppm NaCl, 225 psig (15.5 bar), 77°F(25°C), 5% recovery. Permeate flow rates for individual elements may vary +/-20%.